Is Mr. Market Still Relevant? Mr. Market is an analogy that all Warren Buffet and Benjamin Graham scholars are familiar with. The analogy helps to explain the volatility of the market and why it is important to ignore the daily fluctuations and focus on a longer time horizon. The story goes that you need to imagine that you are part owner in a private business and that your partner, Mr. Market, comes to you daily to name a price in which he will buy your interest, or sell you his. While the business is relatively stable over the long term, Mr. Market suffers from manic depression and his quotes will range wildly day over day. One day he may be feeling very positive and euphoric and his quote will be very high, while the next day he is negative and depressed, offering a low quote and a great opportunity to buy his interest at a discount. This story serves to remind investors that similar to that private partner, the market will fluctuate over time with no change in the underlying value of the business. The takeaway lesson here is to buy a strong business and ignore the emotions of the market. But is this story still relevant today? After all, investing has come a long way, and with the fire hose of information pointed at us every day, markets should be efficient, right? Using monthly S&P 500 data dated back to 1872, we can measure just how frequently the market is up or down, and compare the volatility of the earnings and GDP. Quickly, how often do you think the annual return using monthly data was over 10 percent? How about between 0 percent and 10 percent? How often do you think the return was below 0 percent all the way to -10 percent? Lastly, how often do you think annual losses were greater than -10 percent? You may be surprised that the data does not vary much between the last 10 years and the last 140 years. I would assume that readers would expect the returns of the last 10 years to be less optimistic than the data shows. On the contrary, annual returns were positive about 81 percent of the time while historically, annual returns are positive about 7 times out of 10. However, you will also see that the average and median returns over the last ten years have been lower than history would suggest. 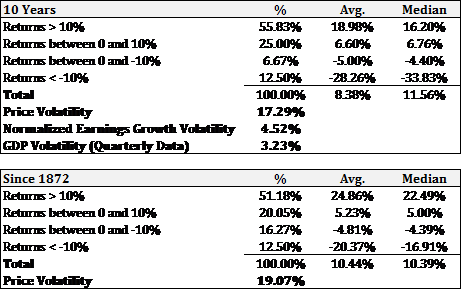 These numbers guide us to see that returns are generally positive, and that markets not only historically, but also currently, tend to be more irrational and volatile than the economy. While this volatility may be destabilizing, it also offers investors great opportunities to buy securities ‘on sale.’ So yes, Mr. Market is still very alive and well. The key to using this information is to remember that Mr. Market is there to serve you as an investor – not to serve you as a guide.